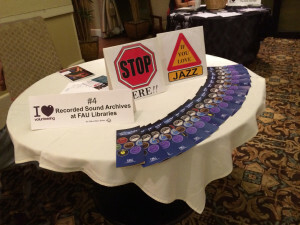 RSA’s sound technician, Ben Roth, set up a table and tried to entice passersby to sign up at Boca Pointe’s Volunteer Fair on Tuesday, January 20, 2015. Not much luck. People are often amazed at the number of recordings that the RSA has been able to digitize and put online. “How do you do it?” That’s a question we often hear. But why should you volunteer when you have so many other things to do? What’s in it for you? So here is my top ten reasons to volunteer at the Recorded Sound Archives in FAU Libraries, Boca Raton. 10. You can reminisce about some of the world’s greatest Jazz musicians as you enter information from LPs into the database. 9. You can learn more about Jazz history, songs and musicians by reading the backs of album covers. 8. You can improve your mind and improve your memory by exercising your brain muscles. 7. You can improve your manual dexterity and keyboard skills. 6. You can feel good about spending your time doing something useful and worthwhile. 5. You can volunteer whenever you have time to kill as long as it is on Mon through Thurs between 9am and 4pm. 4. You can enjoy the ambiance of FAU’s beautiful Boca Raton campus and the Wimberly Library. 3. You might make new friends. 2. You can see and hear demonstrations of the RSA’s antique equipment, including an original Edison cylinder player and two console Victrolas from the 1920s. And the number 1 reason to volunteer at the RSA….. Contact Alethea Perez at 561-297-0080 for more information.